The Delhi University MBBS BDS 2019 Application form process will go to start soon. Applicants, if you are interested in this process, must read full notification through the official site and then if you are eligible for this must fill the application form before on the last date is 2019. The admission to MBBS and BDS programs in Delhi University is done on the basis NEET. So applicants before applying this must qualify the NEET examination. The DU MBBS BDS FMSC 2019 examination will be conducted for providing the admission in around 500 MBBS offered in 3 medical and 34 BDS seats in 1 dental college affiliated to Delhi University. We know most of all applicants will be waiting for this opportunity. So don’t miss this check whole detail of notification by the help of this page and then apply for Delhi University MBBS BDS 2019. The age of the applicants is 17 years for this application form. For applying this application must be Indian Nationals/Overseas citizens of India. Candidate’s education must 10+2/HSC with Physics, Chemistry, Biology/Biotechnology and English subjects through the valid board. Female candidates from outside Delhi who belonging to SC/ST/CW category have passed10+2/HSC is eligible for admission to Lady Harding Medical College only against the seats reserved for these categories. The selection procedure of applicants will be complete on the basis of NEET examination scores. All the percentage criteria for NEET will be mention below in this table. MBBS: Time Duration is 4½ years, followed by one-year compulsory rotating Internship Training. BDS: Time Duration of this course is 4 years, followed by one-year compulsory rotating Internship Training. The application form will be filling with the help of the official site. Check application form through the official site and read the full notification. Then if you are eligible for this must fill this application form and attest all document with the application form and pay the application form fee and send to the application form to giving an address. Class 10th certificate showing the date of birth. Class 12th Mark Sheet and Certificate. Must have their Character Certificate issued by the Principal of the school last attended or from any Gazetted officer. In case of SC/ST then must have two copies of Scheduled Caste/ Scheduled Tribe certificate. Non-creamy layer certificate and OBC caste certificate as per the Central list for OBC. The school is situated in an area of National Capital Territory of Delhi. The school is recognized by the CBSE/Council for the Indian School Certificate/ Jamia Milia Islamia. The applicant has attended regular classes in the school for class 11th & 12th. Check the suitable application form in PDF file. 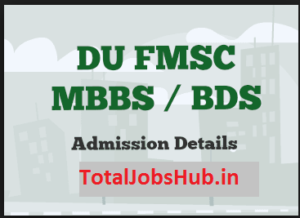 Now after getting the link read all instruction about DU FMSC MBBS/BDS application form 2019. After checking the application form fill the registration form neat and clean with correct detail. At last, take the print copy of this duly filled form with you for further usage. Demand Draft/Banker’s Cheque in favor of the “Registrar, the University of Delhi” payable at Delhi. Sanding address: Faculty of Medical Sciences, 6th Floor, V.P. Chest Institute Building, University of Delhi, Delhi – 110007. Check future detail of Delhi University MBBS BDS 2019 through the official website.